• Special “Stay” Pricing-Guests that book the hotel’s best available rate for their first night stay will get a second night for only $19.76, in commemoration of the year that the hotel first opened on the Boca waterfront. This special rate is available April 14th through April 27th. The package is only available by calling the hotel directly at (561) 368-9500. • “A Rollback” in Price of the famed Sunday Champagne Brunch at Carmen’s Restaurant at the Top of the Bridge—every Sunday in April, guests can enjoy a delicious spread of gourmet food and drink offerings for just $34.00 per person. • “Double the pleasure” at WaterColors restaurant, the only open-to-the-public waterfront dining in Boca Raton, featuring half-price on all well brand drinks all day long, and 50% off appetizers every day from 4:00 p.m. to closing. The Bridge Hotel remains one of Boca’s most notable, as new ownership reinvents it to be more relevant and exciting to meet the desires and needs of today’s discerning vacationers as well as social and business guests. Led by a seasoned team of hotel ownership, management, designers, and marketing consultants, the reinvention plans will reposition the hotel into a premier South Florida experience with its own distinctive signature for the destination. The design direction and inspiration for the aesthetic and structural reinvention of the Bridge Hotel was recently revealed at a special “Preview Reception” held in Carmen’s Top of the Bridge, showcasing the new designs and the breathtaking views of Lake Boca, the Intracoastal and Atlantic Ocean. The complete transformation to a luxury four-star hotel status will include the introduction of entirely new hospitality and dining concepts, with plans to take optimal advantage of the property’s most distinctive assets: its prime location – on the Intracoastal Waterway and Lake Boca with direct access to Atlantic Ocean – and its breathtaking water views. The preliminary phase of the Bridge Hotel’s major “reinvention” was launched in November 2012 with the construction of the hotel’s new dock-to-dine “waterfront promenade” that flanks the property’s entire Lake Boca perimeter to expand hotel guest and community food and beverage enjoyment opportunities. According to Russ Flicker, managing member of AWH Partners, LLC that in partnership with The Lane Organization purchased the boutique hotel property in August 2012, the extensive property architectural reorientation will feature a new “sense of arrival” and relocation of hotel’s entrance, innovative interior design renovation concepts for the lobby, registration area and guest rooms, and the addition of an indoor waterfront restaurant as well as expanded outdoor waterfront dining and public spaces conceived by the commissioned Gensler design and architectural firm. 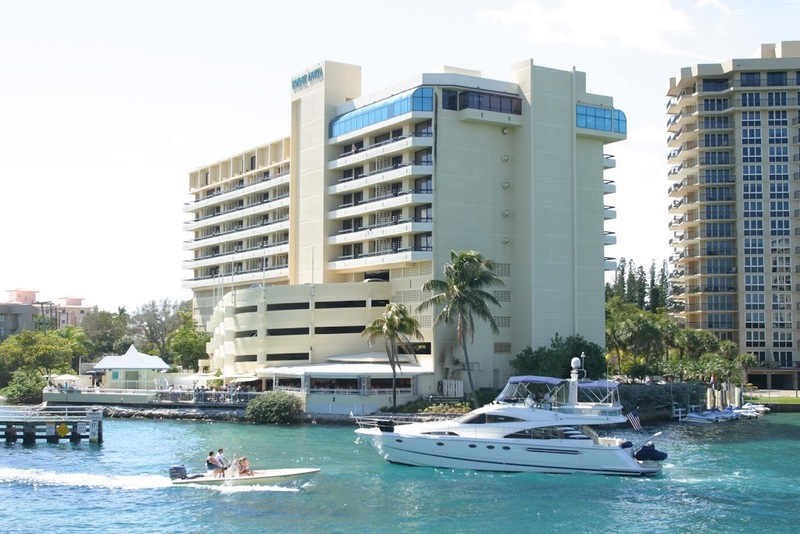 The Boca Raton Bridge Hotel, one of Palm Beach County’s boutique icon hotels with panoramic water views from every guest room, is located where the Intracoastal Waterway and Lake Boca Raton meet at 999 East Camino Real in Boca Raton. Hotel reservations are available until April 27th; visit www.bocaratonbridgehotel.com or call (561) 368-9500. For dining updates at WaterColors or reservations for Carmen’s award-winning Sunday Champagne Brunch, call (561) 886-4570 or visit www.opentable.com. Reservations are open now and throughout the summer and fall for advanced booking of post “re-opening” private dining functions and holiday parties; for more information call Fran Bannon at (561) 368-9500 or email her at f.bannon@bocaratonbridgehotel.com.